Hierarchy, that is, some things must happen before others can work. The brains control center has four levels and the lower ones must be working for the higher ones to run correctly. Value systems, that is, some things are more important to the brain than others. Synchronization, that is, what is happening or not happening together at any given moment in time greatly impacts its significance to the brain. Believe it or not, this hierarchical brain model actually makes the explanations easier as well as more powerful and useful. The Life Model’s hierarchical brain model is the basis for the THRIVE training. There are several current models of brain function competing for explanatory value and details about the science behind this discussion can be found in an appendix of Living With Men by E. James Wilder or you can download a copy of that appendix from this site. Here is a short quotation from Appendix B. The hierarchical brain model is, in large part, the work of Dr. Allan Schore. Dr. Schore has written some of the best technical descriptions of current research on brain changes during the development of maturity. Dr. Schore has combined the theories and discoveries of several different disciplines in order to make sense of very complex and separate fields. Dr. Schore’s brain model is hierarchical which is a very important distinction. His diagram entitled Schore’s Right Brain Dual Corticolimbic-Autonomic Circuits outlines the ascending levels of the brain’s emotional control center. I find this hierarchy particularly significant because it explains why trouble at a lower lever will affect all the levels above it. Schore’s hierarchical three-level structure is the basis for the four level control structure in the right hemisphere described in chapters 2, 4 and 9. 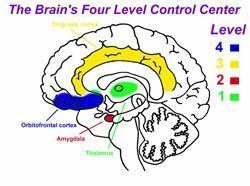 The top three levels of my model, the prefrontal cortex (4), cingulate cortex (3), and the amygdala (2) are directly from Dr. Schore’s theory. The bottom layer (related to attachment) is suggested by the work of Dr. Daniel Siegel and the brain scans by Dr. Daniel Amen. There are three distinctive elements to Dr. Schore’s theories that, when combined, make his theories stand out above the others. First, is his understanding that brain structures function in a hierarchical way rather than a modular one. Second, his model is based on synchronization of brain activation in time “windows” not just brain area functions or biological states. Third, Dr. Schore’s brain model is both individual and mutual--subjective and intersubjective. What we can make of this is a brain where small critical areas make great differences to the rest of the brain. The overall performance of the brain is not simply a matter of what its parts can do but what they do together at a given moment in time. And our brains are not so private and locked in our skulls as we might suspect, but rather share powerful, mutual states of mind at given moments in time with other brains. These states are so closely linked that we can conceive of both an individual and a mutual mind, which must both be running well across the entire lifespan. The advantage of Dr. Schore’s hierarchical model over a modular one is that a hierarchy in the brain establishes both an order of brain development as well as the order in which brain functions break down if there are problems. For example, in a modular approach like Dr. Amen uses, he will simply find out which modules are working and which are not and prescribe solutions for each. Dr. Schore’s hierarchical model predicts that if the middle level (the cingulate cortex) is not working, the top level (orbitofrontal cortex) will also be impaired as will the synchronization between hemispheres. You get more for your nickel with a hierarchical model. Used by permission from the Life Model book The Complete Guide to Living With Men written by E. James Wilder and published by Shepherd’s House Inc. ©2004 E. James Wilder.